Plenty of burglaries happen through the garage door. Most burglaries occur between 10 a.m. and 3 p.m. and take less than 30 seconds. In other words, burglaries happen during the day while you’re at work, and your garage is more vulnerable than you give it credit for. That’s why Home8 Smart Garage Starter Kit is looking to protect your garage. 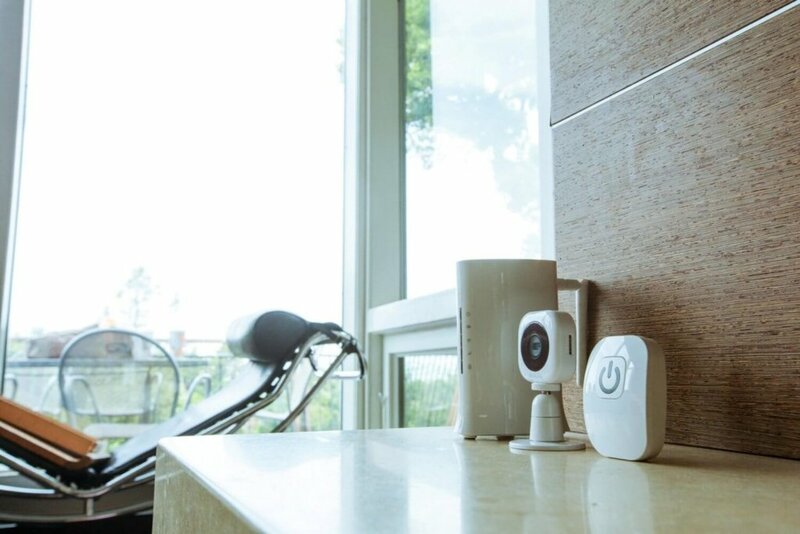 If you haven’t heard of them, Home8 is a growing brand that’s looking to take on the “big guys” as an all-in-one security system without monthly fees. It’s a venture by MivaTek that’s just getting launched, and it will be interesting to see how they fit into the smart home puzzle. Here’s our take after unboxing and playing with the Home8 Smart Garage Starter Kit. 1.3 How would I use this? Affiliate Disclosure: This page contains affiliate links, which earn us commission from Amazon at no cost to you. Disclaimer: The writers of this blog received a free sample of the product for review. They were not compensated in any other way. The opinions are 100% their own and not influenced. Before we crack open the Home8 Smart Garage Starter Kit, let me introduce Home8. They are a different kind of smart home company because they are looking to fix one of the most annoying things about the current state of the smart home—it’s complicated. Some devices work together, while others don’t, making your phone a jumbled list of downloaded apps. Each control different gadgets around your home, and none if it quite makes sense. Home8 offers 8 different starter kits. Some come with cameras, others have a security emphasis, and other starter kits are focused on elder care and medication tracking. Strong security: double firewall and bank-level security for protecting your videos and information. 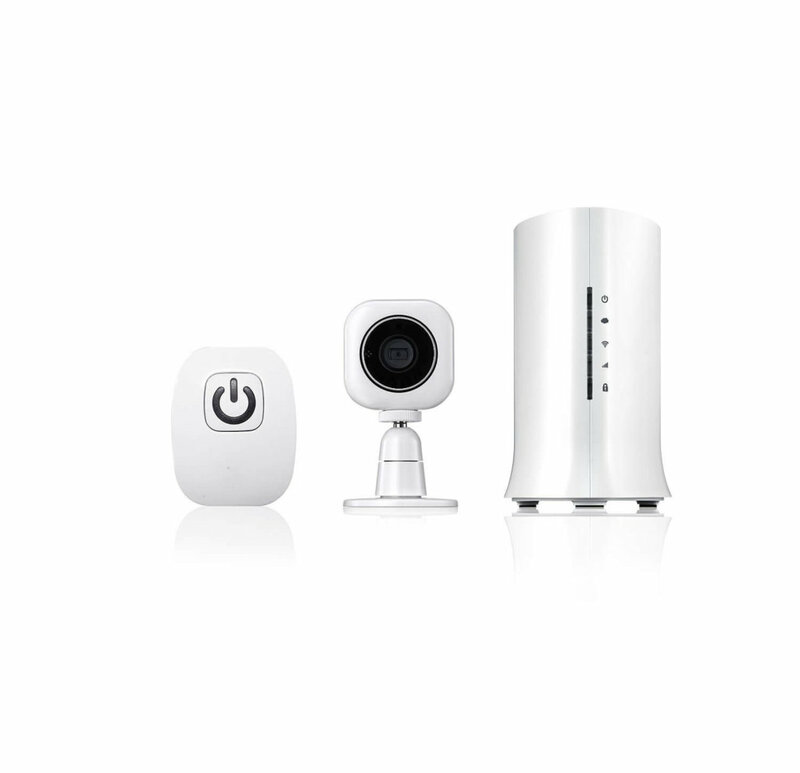 After you choose a starter kit and set everything up, Home8 makes it easy to add individual products like a security camera, keychain remote, fire and CO sensor, panic button, smart plug, wifi range extender, motion sensor, door and window sensor, or even an additional siren. Purchasing and combining these smart home devices from different manufacturers is normally a huge headache, but Home8 makes it easy. It might seem overwhelming to set up a garage door controller, but it’s actually just a matter of hooking a few wires onto your existing opener. For installing the system, you can either add it to your existing garage door opener, replace your existing switch, or get out a ladder and attach it to the motor. The kit comes with secure strips for sticking the controller wherever you decide will work best for you. We created an in-depth video review showing you how to set up your device and reviewing it overall. A study by Parks Associates found that 15% of U.S. broadband households plan to purchase a smart garage door opener during the year 2016. Of the 9% who already own a smart garage door system, 50% use it on an almost daily basis, controlling their garage with their phone, tablet, or computer. This kit is also great for security since the camera can send you motion notifications if it sees someone in your garage. Beyond that, it’s difficult to use Home8’s Smart Garage Starter Kit for day-to-day monitoring. The device is programmed to notify you only if someone presses the smart controller or uses the app to open the garage. If someone opens it with the traditional keypad or the original opener, you won’t be notified. You can set motion notifications on the camera. We had some issues initially setting this up, but you just have to adjust the motion and audio sensitivity within the app. Note that for the camera to detect motion, it has to be armed from within the app. When you arm the system and it detects motion or audio, your security shuttle will sound its siren. This means if you just want to keep an eye on when your teenagers or house sitters are coming and going, you won’t be able to get notifications without arming the system and having the alarm go off. One work-around for this issue is to install the button controller by your door. You’ll naturally press it when you come and go, but if you install it up high on the motor, it makes it impossible to get those kind of notifications. Of course, even if you had it next to your door, people might not know to press it if it’s next to your traditional controller. Okay so if your system is armed and detects motion, it triggers the alarm in your security shuttle to go off. Since your security shuttle has to be plugged into your router, and your router probably isn’t in your garage, this isn’t a very useful feature. The siren is loud, but not loud enough to be heard in most garages on the other side of your house. Where the shuttle’s alarm comes into play is if you expand your Home8 system. Add some door and motion sensors inside. If someone breaks in or opens a door and hears the siren, they will probably turn around and run the other direction. While Home8 is a newer company, it’s promising that they already have an IFTTT channel with integration for blinking your Hue lights when Home8 detects an intruder, turning off your WeMo switch if a water leak is detected, and other functionality. The channel is small, but it’s growing. Many smart home products don’t have IFTTT integration for a long time, so it’s impressive that Home8 is prioritizing this kind of functionality. Overall, here’s our takeaway of this product. Great app design, extremely easy to use. Very easy setup and installation. Camera has nice features like 2-way talk, 720p display, motion alerts, and SD card options. Hardware looks nice. I like how the security shuttle hub lights up to let you know if it’s connected or there has been a breach in your security. Nice all-in-one solution for adding additional products under the same brand. You can finally control your home from just one app. Camera buzzed (although it’s in your garage so that’s not a deal breaker). Only one user is free. You have to pay a monthly fee for any additional user to access the account. This is easily the biggest downfall. 2 users should be free, with additional users charging an extra fee. You have to use the smart controller or the app to get garage opening alerts. In other words, you won’t get alerted if someone opens with the keypad or original garage door opener that you already owned. The siren is not very useful since it’s located in the hub by your router, and not in your garage where someone is breaking in. Although this would be beneficial for other Home8 devices if you integrate more of their products. Can’t receive motion alerts without having the siren go off. We have a dog sitter come by sometimes, and it would be nice to get video alerts when he comes by. The only way to get alerts is to fully “arm” the system, which will trigger the siren to go off right when it recognizes him. Just like the first version of Nest or other well-known smart home products, the Home8 Smart Garage Starter Kit is a starting point. There are certainly improvements that Home8 can make, but these will come over time. 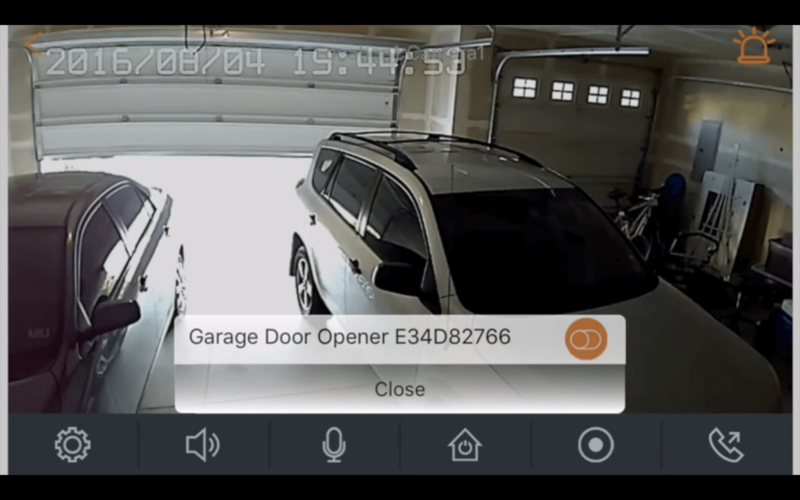 If you’re looking for a product to check if your garage door is open or open and close it remotely, Home8 is a great option because it comes with the security camera. There’s nothing quite like it on the market, and it will be exciting to see how the Home8 Smart Garage Starter Kit evolves over time.